Not sure how to remove graffiti from your domestic or residential property in Melbourne? Abrasive blasting is a safe, efficient way to remove graffiti from various types of surfaces and materials used to apply graffiti. ProStrip Sandblasting uses specialized abrasive blasting technology for graffiti removal to ensure that dust and paint particles do not become airborne. This means you can avoid dust and toxic fumes associated with traditional sandblasting and concrete sandblasting, as well as do not have to worry about any health and safety risks associated with conventional blasting procedures. When looking into how to remove graffiti from your domestic and residential property or how to remove graffiti from concrete with concrete sandblasting, the many options can be overwhelming. If the use of solvents, chemical strippers or just painting over the graffiti aren’t for you, dustless blasting is an environmentally friendly option. Since there are no dust clouds produced by this low abrasive blasting method, the spray paint and paint used to create graffiti are not released into the air and this method can be performed in open environments. There is no need for an airlock or full blast suit. Water and an abrasive, such as sand or glass, are combined in a tank and applied to the surface to be cleaned using high pressure. During the blasting process, the water used during graffiti removal traps the paint and other debris and instead of becoming airborne falls to the ground. This means there is no dust or toxic chemicals that need to be contained. Because both water and an abrasive are used in this process, surfaces are cleaned quickly and with less material. Depending on the type of surface being cleaned, pressure and water temperature can be adjusted to protect your residential or domestic property from damage. Graffiti is removed easily while leaving the surface beneath cleaned and restored. 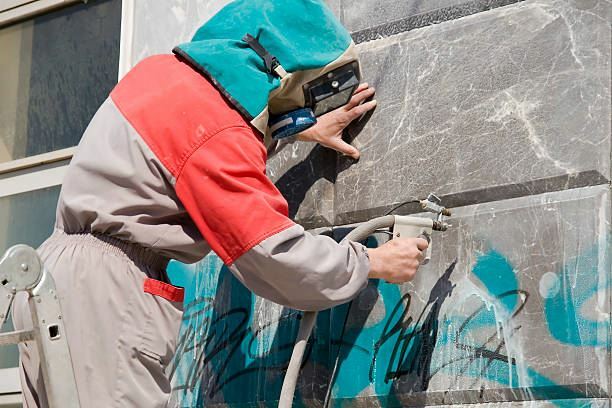 Contact ProStrip Sandblasting to inquire about graffiti removal in Melbourne today!